To evaluate changes in management practices and its influence on short term hospital outcomes in patients with acute myocardial infarction (AMI) admitted during two different time periods, 2007 and 2004. We studied AMI patients from two acute coronary syndrome registries carried out in Kuwait in 2007 and 2004. We included 1872 and 1197 patients from the 2007 and 2004 registries, respectively. When compared with 2004, patients from the 2007 registry had similar baseline clinical characteristics. In 2007 compared to 2004, during the in-hospital period, patients with AMI received significantly more statins (94% vs. 73%%, p<0.0001), Angiotensin converting enzyme (ACE) inhibitors and angiotensin receptor blockers (ARB) (70% vs. 47%, p<0.001), and Clopidogrel (38% vs. 4%, p<0.001), while beta-blockers use dropped in 2007 compared to 2004 (63% vs. 68%, p=0.0066). The rates of in-hospital mortality and recurrent ischemia were significantly lower in the 2007 cohort compared with the 2004 cohort (for mortality 2.2% vs. 3.9%, P=0.0008, for recurrent ischemia 13.7% vs. 20.4%, P=0<0.0001).Higher utilization of angiotensin converting enzyme inhibitors, angiotensin receptor blockers and statins were the main contributors to the improved in-hospital mortality and morbidity. In the acute management of AMI, there was a significant increase in the use of statins, ACE inhibitors and Clopidogrel in 2007 compared to 2004. This was associated with a significant decrease in the in-hospital mortality and recurrent ischemia. Adherence to guidelines recommended therapies improved in-hospital outcomes. 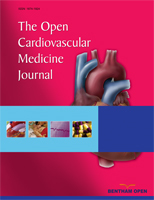 Keywords: Acute Coronary Syndrome, Outcomes, Evidence based therapies..
© Al-Jarallah et al. ; Licensee Bentham Open.